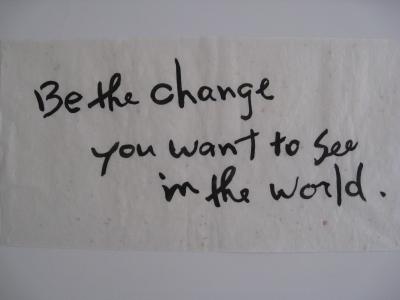 This , "Be the change you want to see in the world", is Mr. Ted Geary's favorite words. He told me that this quote means that a person should model his or her behavior on the way you think it would improve the world. If you want a more fair world, treat others fairly. If you want a more just world, treat others more justly. He is an American and lives in New York. He is an admissions coordinator and is in his 20's.